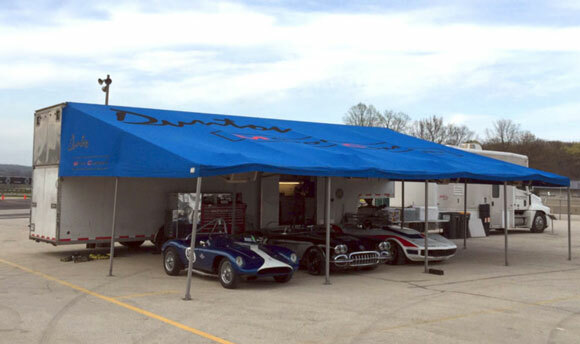 The spring race at Road America is always a little early for the local weater pattern. 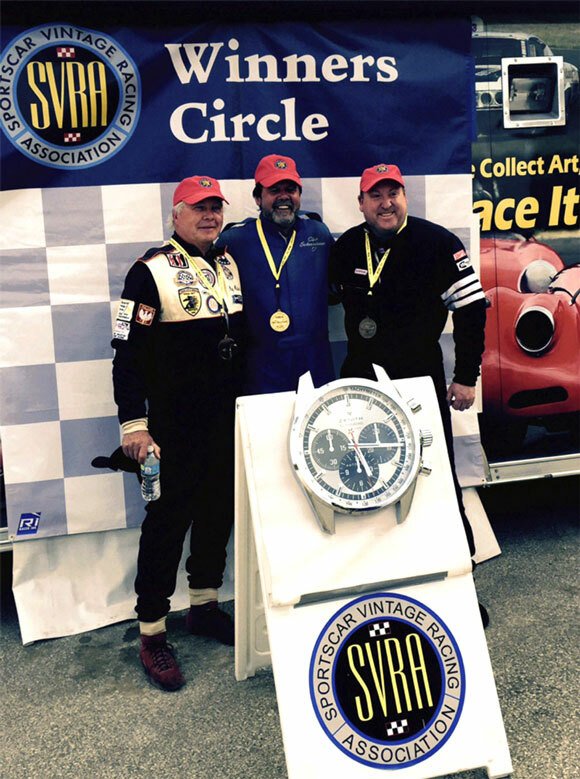 In the past SVRA racers have experienced snow, torrential rain and hurricane force winds. This year it was extreme cold mixed with a light dusting of snow. Qualifying went about as expected with Clair Schwendeman taking pole position by two seconds over the Camaro of local veteran racer Ray Mulacek. In the Saturday feature, Clair went to sleep on the first lap and let Ray get by in Turn 6. That got Clair’s attention and he got around Mulacek and went on to win by 7.6 seconds, with the Group 12 Corvette driven by Kirk Blaha third overall. 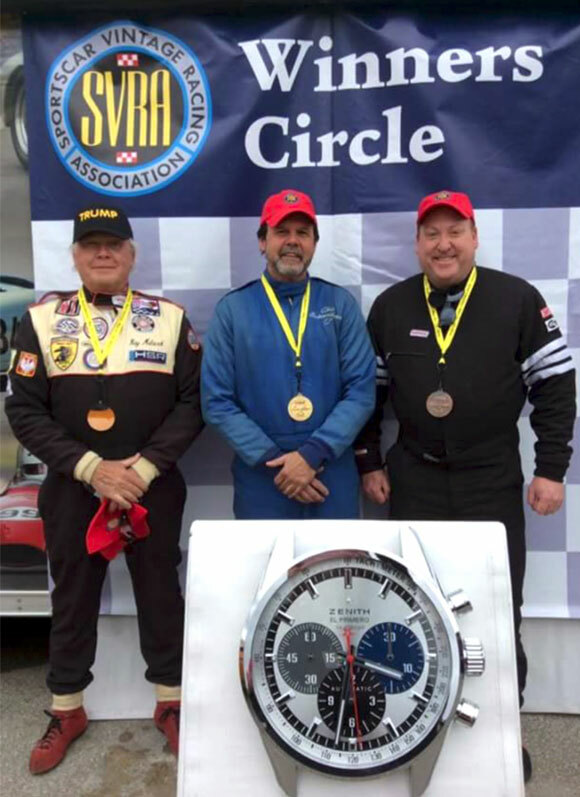 SVRA has a new podium procedure for Group 6, with big-block AP cars on one podium while everyone else competes for a separate podium. It is rather bizarre, because in the case of the AP podium for the first Group 6 race at Road America, Rick Mooney was in the third place position on the podium, but actually finished fourth overall. Clair Schwendeman being interviewed for local TV after the race. 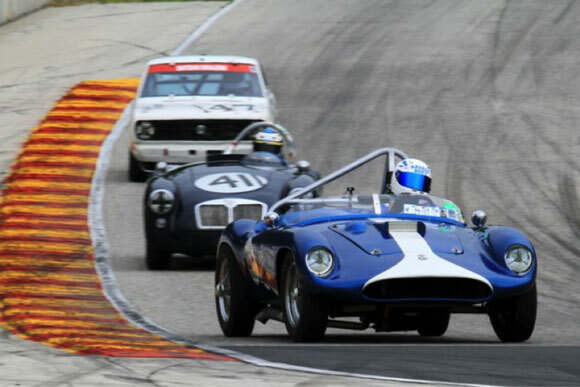 Road America with its long straights is the worst possible track for the underpowered Devin MG, and SVRA moved Susie from her normal Group 4 into the slower Group 1 where she was still thirty-eight seconds off the fastest lap of the Group winner. 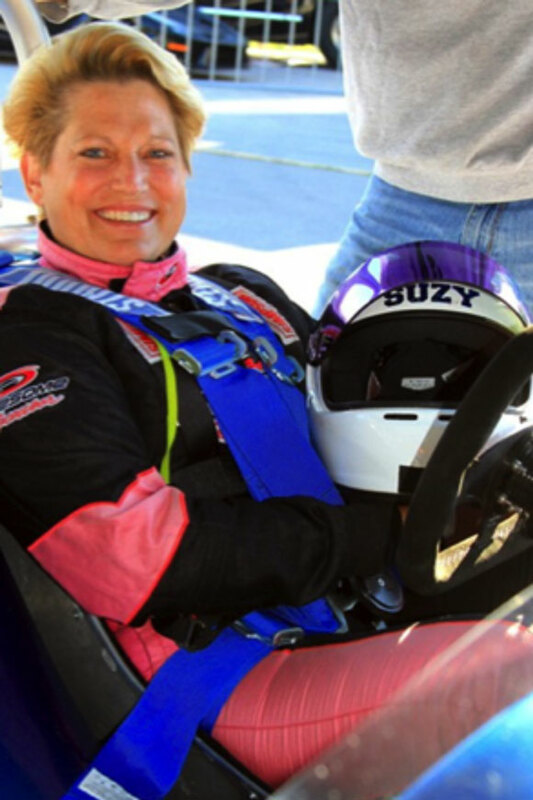 Susie never made a mistake and drove the car as fast as it could go. 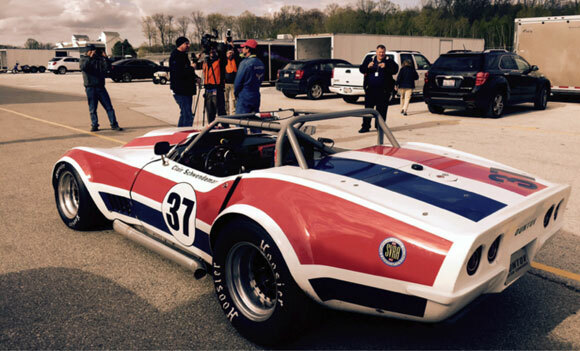 It just doesn’t have enough power to mix it up at a long and fast track like Road America. Alan and Clair hoped to erase their only enduro loss in 2015. At Road America last year, the team chose not to stop for a second mandatory pit stop during an extended yellow flag period, which caused them to finish third behind a Porsche and a Camaro who both stopped twice under yellow. This year Alan found a new way to lose a Road America Enduro when he started the pit stop timer almost 10 seconds before the official pit entrance timing cone. 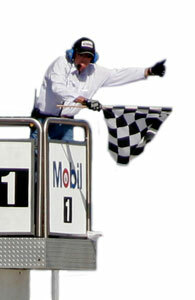 The result was a pit stop several seconds short of five minutes and a black flag. In the Sunday Group 6 race, Clair did not give Mulacek another chance and was on the ball from the green flag. He won by 10 seconds with Mulacek again second and Rick Mooney finishing third this time. This time the politically correct asked Mulecek to lose the Trump hat. Tony Parella never got a chance to run a lap in his Group 4 1958 Corvette. Sometimes that is the way it goes in the racing life of the SVRA owner and CEO. 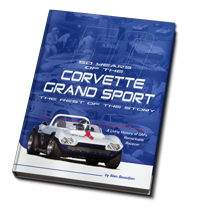 Duntov Motor Company is the exclusive licensee for the continued production of the authentic original Corvette Grand Sport. Duntov Motor Company is the exclusive licensee for the manufacturing and distribution of the updated street version of this famous car. We service what we sell. We also restore and service 1963-1982 Corvette race, street and performance cars using original and replacement parts including front and rear suspension, brake calipers, brake rotors, brake pads, both J-56 and stock brake caliper pistons, and Corvette stainless steel parking brake parts. We offer the finest original U.S. built Corvette spindles and GM stub axles, along with remanufactured Corvette differentials for both street and race cars. We build both new and rebuilt Corvette trailing arm assemblies for 1965-1982 Corvettes, and offer Corvette street and racing springs and both steel and composite leaf springs in a wide selection of spring rates. Check out our Corvette parts section for shocks, sway bars, upper and lower A-arms, Corvette ball joints, tie rod ends, pitman arms, idler arms, shocks and U-joints. Copyright © 2010-2017 Duntov Motor Company. All Rights Reserved.